-- Select a Size/Color -- X Small - Out of Stock! Small - Out of Stock! Medium - Out of Stock! Large - Out of Stock! X Large - Out of Stock! 2X Large - Out of Stock! 3X Large - Out of Stock! 4X Large - Out of Stock! 5X Large - Out of Stock! 6X Large - Out of Stock! 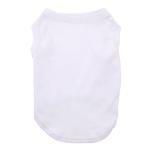 Our Plain Dog Shirt in White will have your dog looking fabulous in this versatile shirt. Stand out among all the other dogs! 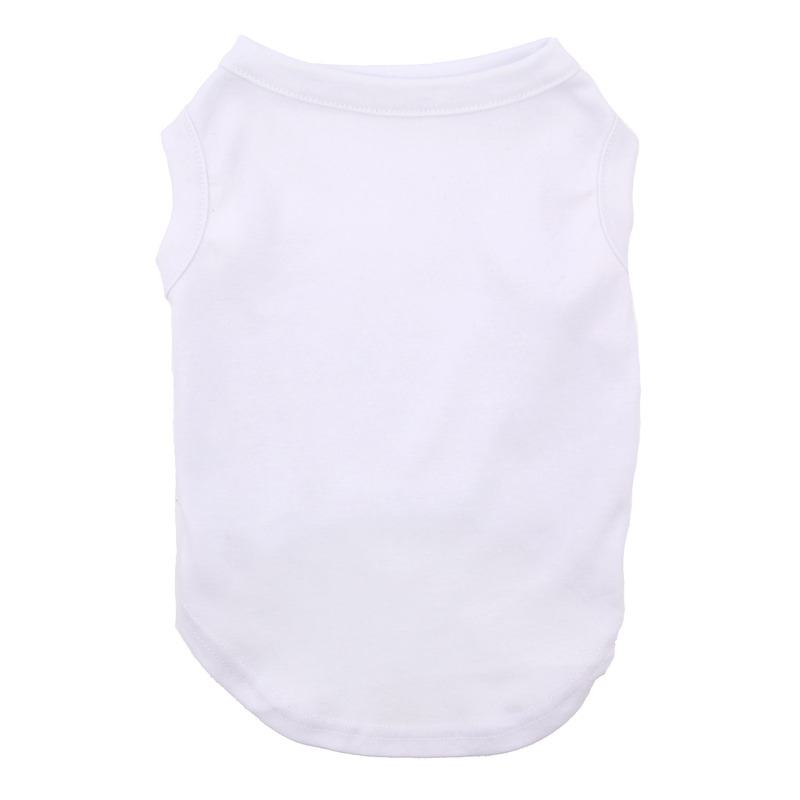 The Plain Dog Shirt in White is a cool, comfy design for a perfect look year-round. Plus, the classic white makes quite a fashion statement! 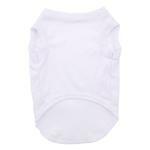 This white dog shirt is appropriate anytime, and it reflects light to make your pup stand out and stay cool. For even more fun, add iron-on patches, embroidery, or screen printing to commemorate an event or just for cuteness. Have the dog help your event be even more special by designing these tanks for graduation parties, announcements, birthdays, baby or sports teams. You could also customize these for a charity or pet events. The sky is the limit! Great for personalizing or screen printing on your own. 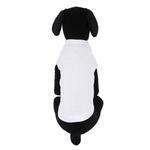 This is a classic and simple style for your dog! Made with a 65% cotton 35% polyester blend. Plain Dog Shirt - White Customer Photos - Send us your photo! Minerva thinks she is a turtle. She follows Timothy around the yard. Under supervision and they take an evening stroll. Six-month-old Shiloh just got back from seeing Ken Kesey's Furthur bus, which is presently touring the United States for its 50th anniversary, and he wanted a tie dye shirt of his own. So, we ordered the plain white shirt and tie dyed it. As you can see, it tie dyed beautifully :) ! Noodle loves dressing up for halloween. I took the basic white tee and sewed her costume to it so that it comfortably stays where it should. Jenny is a sassy chihuahua with great style! This plain white shirt goes great with her stylish tutu! Jelly Bean is wearing a xs. This tank fit so well, I ordered 3 more. To change my look, momma just changes my skirts. enjoying his bone in his white tee! so cuddly in his white shirt ! Got this shirt to go with the Puppia Bobby pants. This shirt will be great for layering with the pants or with any hoodie or coat for an extra layer to get through this cold winter! Posted On 12/30/17 by Cheryl w from , OH Yes, Cheryl w recommends this product! Works out perfect. 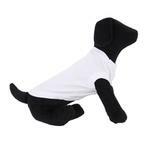 Bought a couple of these Plain Dog Shirts for my GSP who sheds like crazy. Thinking it would help from getting hair everywhere. So far so good. Love Baxter Boo?? Posted On 01/18/17 by Julianna F from , IA Yes, Julianna F recommends this product! Perfect light weight top to have on hand. Posted On 11/11/16 by Michaelle W from , Yes, Michaelle W recommends this product! This shirt fit perfectly on my 55lb Pit Mix. She is very hard to buy for because she has the thick neck and shoulders of a Pit that are oddly disproportionate to her length. It is a little long on her, but not so much as to be a problem. I ordered white and then put a pretty HTV design on the back to dress it up. I had a great experience ordering from this company! I had a great experience ordering from this company! Everything fit. Everything came a day early Thanks! Posted On 04/06/16 by Brenda from South Berwick, ME Yes, Brenda recommends this product! I love these t-shirts. I use them as layers under a coat in cold weather and on their own in the house when my elderly dog seems chilly. I bought it in white thinking it might also help with tick control in summer since a tick would be highly visible. Be sure to read the sizing charts on the various styles of t-shirts since they vary. Posted On 02/04/16 by Bren from , ME Yes, Bren recommends this product! I have several of these shirts in various colors for my 11 pound mini Schnauzer. A size Large fits him well. He wears them inside every day during the winter and whenever he is groomed and his hair is short. I put his sweater or coat on over the T-shirt when I take him outside and the extra layer adds warmth without being bulky. The shirts wash and dry well with minimal shrinkage. The shirts are cut fairly full around the belly area for his build and they would fit a dog with a stockier build as well. I use this as a base to make costumes. Posted On 11/15/13 by Sasha H from sarasota, FL Yes, Sasha H recommends this product! I have a white chihuahua and I used this shirt as a base to make her halloween costume. I ordered the medium because she's doesn't clearly fit into the size specifications and then I hem it to fit her properly. I will order another one for her next costume. Great shirt to tie dye! Posted On 11/08/13 by Monica M from Lake Geneva, WI Yes, Monica M recommends this product! I looked all over for a plain white t-shirt to tie dye for my dogs for Halloween. This product is perfect & the shirts all turned out totally hippie! It's not about the item! In my book is the people / business I’m dealing with. It’s been a pleasure doing business with your company. Excellent service!